Agnieszka Konopka holds PhD in the psychology of emotions, is a practicing coach and therapist and author of a contemplative art-therapy/coaching method ‘Compositionwork’. 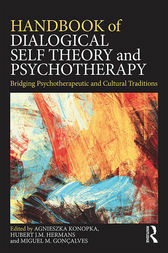 Hubert J. M. Hermans is an emeritus professor of psychology at the Radboud University, The Netherlands, and creator of Dialogical Self Theory. Miguel M. Gonçalves is professor at the School of Psychology, University of Minho, Portugal. His main interests are research and clinical practice in dialogical and narrative perspectives.